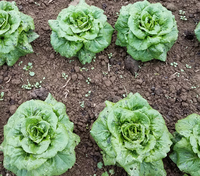 These are our New Additions for 2019, and as always they include our latest on-farm breeding refinements, and some good proven varieties that organic growers have found reliable and adaptive. We have chosen not to seek PVP or other intellectual property protection for our original varieties. We have studied, argued, consulted, and meditated on the relative virtues and hazards of IP protection in the food sector of life. We've tried recently to contrive some variation on the use of Creative Commons 'Copyleft' or Open Source Software models to provide open forum use of crop genetics, without fear that corporate entities will Patent what others have freely offered. This turns out to be extremely complicated, completely untested in the courts, and fraught with real world differences between creative intellect, software code, and new seeds for food crops. To begin with, seeds are alive, and the rest is not. On April 17th 2014, Wild Garden Seed joined with High Mowing Seed and public breeders at three Land Grant Universities (Oregon, Washington, and Wisconsin) to release seeds of our own breeding under the auspices of the Open Source Seed Initiative, OSSI. The purpose of OSSI is to create an ethically bounded genetic commons. The OSSI Free Seed Pledge does by public intention what only endless contracts can do in law. See this OSSI essay more details. New original varieties will be part of the official 2018 OSSI varietal release this spring. Regardless, these new crop cultivars, their genetics, and the traits they express are freely offered to the Public Domain, and they are not intended for any kind of privatization or ownership by others, though others may use them in their breeding, farming, or garden-related enterprises. Wild Garden Seed appreciates recognition for its breeding work by those who use it. I love this basil if only for the smell of it as I brush by heading into the tomato patch. So refreshing! 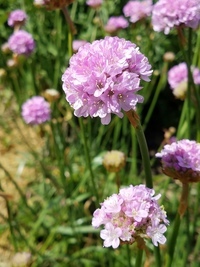 Also makes one of the finest fresh herbs to add brightness and surprise to summer salads. Two or three of the small leaves per serving is all it takes to make a salad spring to life. 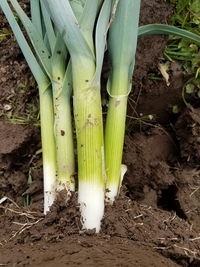 A dark blue-green winter leek, very cold hardy, with nice upright leaves and thick shanks, uniform and heavy set for good yields late into the harvest season. From the Belgian Breeders Mix, a broadleaf blue-blushed winter leek, selected especially for resistance to rust, which seems to be an increasing problem in both leek and garlic around here. Still plenty of genetic diversity for further selection in your own location, but this population has a strong expression of blue (to purple) pigments, with thick to medium shafts well wrapped for blanching. Farm Original Variety! Selected out of 'Delft' for a propensity to self-propagate by cloving garlic-like offsets around the root plate. 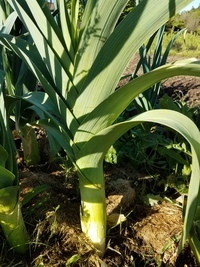 A real "permaculture leek" if harvested by carefully cutting the leek above the root or allowing unharvested leeks to flower before cutting back. New leeks appear in clumps around the base of each mother plant, forming long tender shanks in autumn. Farm Original Variety! 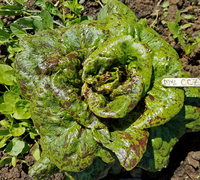 This is a tight little jewel throwing a lot of color, red on green leaves are puckered and crisped, creating texture and a thick leaf with good flavor. Small enough with tight spacing for single serving split-head salad. Farm Original Variety! 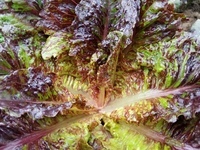 This is a great sandwich lettuce. The golden-green red flecked leaves are large, flat, and loosely whorled for easy picking. The size and shape fit a sandwich or bun perfectly. 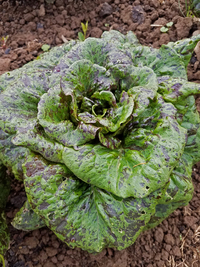 This is something between a leaf lettuce and a romaine. The flavor is mild and sweet. Farm Original Variety! A midi sized gem, about 9" across at full size. 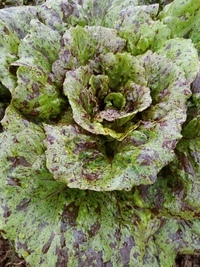 Savoyed, medium green with red spotting, short, broad leaves. Farm Original Variety! A true mini, 6" or less across, dark green with less red splashing inside than the other Islanders. Would make a good single serving lettuce. Somewhat buttery taste and texture. Uniform. Farm Original Variety! A uniformly small, dark green gem with internal red speckling more pronounced than its sister Lopez. Farm Original Variety! Sister variety to 'Fawn', more of a medium green, similar but worth comparing in different locations for taste and performance distinctions. Very uniform. Farm Original Variety! A uniformly small, dark green gem with red speckling, 6" across at maturity. Farm Original Variety! From crosses between our 'Cherry Vanilla' and WSU material, a first release with a mixture of milk chocolate brown and cherry red seeds. Selected for yield and stem strength in 2018. Farm Original Variety! 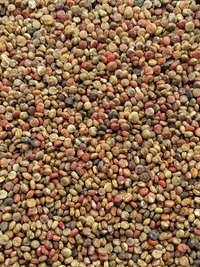 This buff colored seed variety is the first release from crosses between our 'Oro de Valle' and material from the WSU quinoa breeding program. Selected most recently for high yield and stem strength, an important trait combination. 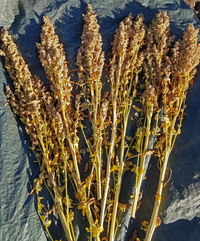 We will be testing this for high amylopectin content (like its parent, Oro de Valle), for use as a processing/noodle quinoa. Farm Original Variety! Antique white panicles on stout stems yield an antique white fine seed. Appears to be head sprout resistant. Farm Original Variety! 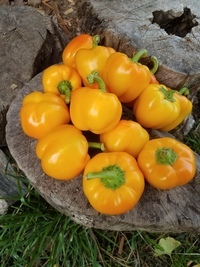 Out of Stocky Gold popped this nearly round little pepper that fits in the palm of your hand. Makes a good snack, maybe the right size to entice kids to take up sweet peppers as finger food. Farm Original Variety! This radish from SE Asia is grown for its edible immature seed pods, similar in texture to pea pods, but with the full flavor of radish. 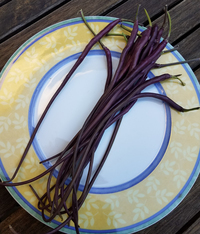 The true rattail variety has slim purple siliques (the botanical term for brassica family seed pods), the earliest being over a foot long with a glossy waxed sheen. Surprising as a crudite, mysterious in stirfry (like, What is this? ), and divine whole alongside a salad for nibbling. 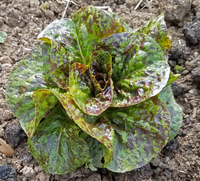 This comes to us from Jim Ternier and family at Prairie Garden Seeds in central Canada, and I think it's the truest to the form described in the 1885 Vilmorin Catalog (The Vegetable Garden). If you scan the other rattail offerings online, you'll see they look like typical radish pods, short, greenish, broad, and bumpy--nothing like a rat's tail. These may be descended from the Madras Radish, also described by Vilmorin, a fleshy version of the normal radish silique. The Ternier's selection is the real thing, albeit with some variation toward the common radish pod. These cross readily with common radish, so keeping purity is a challenge. Very productive plants. Direct sow after frost, and space at least 12" apart. A bit of trellis will keep the 3' plants upright, with pods hanging straight and off the ground for easy picking. This is one of the parents to our in-house tomatoes, an heirloom workhorse variety developed in Florida in the mid 1950s. It has been recognized for its productivity in very hot humid climates, like its sister variety Flora-Dade, which has a worldwide reputation for fruit-set under sub-tropical conditions. This may be related to an abnormally high chromosome number, 2n=26 vs the normal 24, that has been confirmed for Flora-Dade and other sister lines, and in both parents that produced these progeny (Walter and Florida 2153). Our outdoor conditions are neither hot nor humid in western Oregon, but the field fruit set on the 6' determinate Homestead is prodigious. 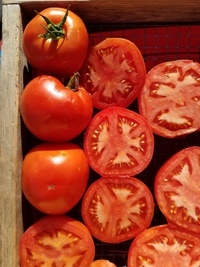 Fruits are about 8 oz, with that idealized red tomato shape, a smooth slightly flattened globe, recommended for slicing and canning. 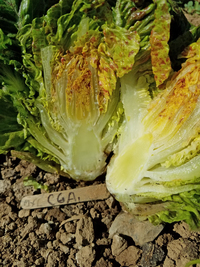 Resistant to Fusarium, generally healthy and vigorous, this may be a good hoophouse or greenhouse variety that avoids heat suppression of fruit set in northern settings, as well as the humid south. Be sure to check out our entire collection of flowers as well. 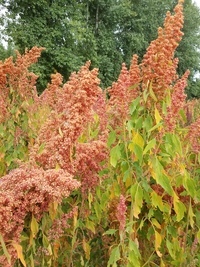 A coral-pink version of languid flowing everlasting amaranth. There are so few flowers that drape from a bouquet with this kind of trailing drama, it seems every cutting garden needs a bed of caudatus amaranths. Looks much like the native sea thrift, bright pink flowering stems standing 12-15" above the evergreen tufted mounds of leaves. 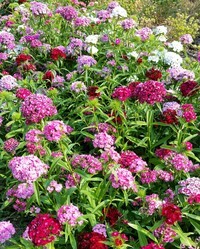 Tolerates any soil in a full sun location, useful for cuts, borders, rock gardens and walls, and other dry situations. This species is generally called Canterbury Bells, characterized by the largest flowers in the genus. 'Cup and Saucer' refers to the variety's combination of a large bell-like "cup" subtended by a whorl of petals that form a "saucer. "This is a color mix that includes purple, blue, pink, and white. Very attractive for bumble bees that favor the bells as overnight sleeping quarters. Grows to 3' with some support. Seed germs well, but is tiny. 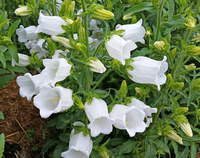 White bells on strong stems to 24" or more, easily grown from seed or by division of the crowns after the first year. Now really, who doesn't enjoy having a bit of a nip in the evening with the cat? Or watching the neighborhood felines sneak over to have a private party in the catnip patch? That's why we have it around. 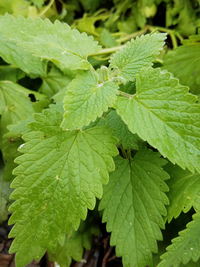 But catnip turns out to be as attractive to bumble bees and butterflies as to cats, and I enjoy their enjoyment as immensely as los gatos. I also find the smell refreshing, and the flowers are beautiful in their own right. Flower folks will find it useful as greenery and filler, and of course it makes a calming tea. Perennial, easily divided for propagation. 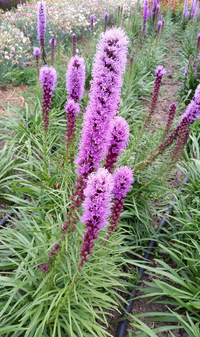 A plumosa type with lemon-lime yellow feathery heads, 2-3' tall with plumes approaching 6" long. Good straight stems, and a color that mixes well with others. 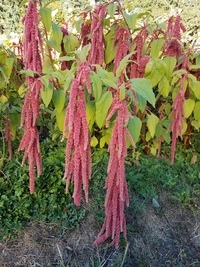 Just as the name describes, dark pink plumes on 30" plants, the heads reaching 5" or more. Fragrant doubled blooms of deeply "pinked" pinks, in colors that include pink, red, white, and striate combinations of every shade in between. 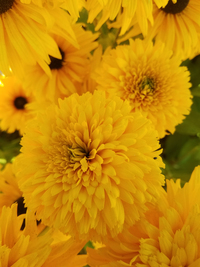 These aren't commonly used for cuts, being 12-15" tall, but they are certainly beautiful in the garden, and if small table bouquets are your thing, these may be a perfect fit. Annual, flowers first year. 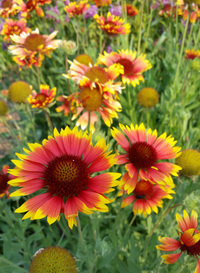 A perennial blanket flower 2-3' tall, primarily the classic red/yellow kind with some beautiful light yellow types. 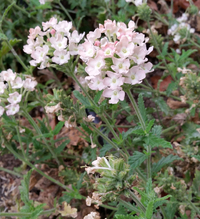 Ever buzzing with pollinators, a drought hardy and persistent bloomer from summer through the end of autumn. This seed came to me from Mary Ellen Chad of Green Spark Farm in Maine, who says it came with the property, probably a named variety, that has now volunteered in abundance for her, sometimes reaching 5' tall. Spacing recommendations vary from 3x3" for intensive flower cutting production, to 12-20" for garden plantings. The intense purple hue and paranormal form of the flowering stalk make this a floral focal point. Stems can range from 1-5' depending on age and conditions. Likes dry soil, don't overwater it. Also a good dried flower. Densely branched with prolific stems reaching 2-3' topped with uniquely tinted flowers. Refreshing smell with soft attractive foliage in a rich green. 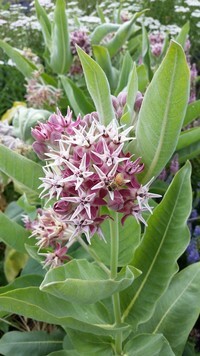 The native food for western monarchs, occurring along the migration routes from the central California coast to western Canada. Many native populations of this plant are endangered by agriculture and development, creating a spotty trail for the traveling butterflies. Pink flower clusters are borne from leaf axils, followed by seed pods with a toothed surface, which split apart releasing wind-carried seeds. Tolerates poor drainage and dry summers. 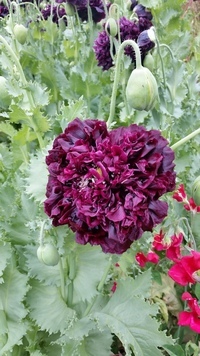 We isolated this from the 'Perky Peony Poppy Mix', a purple so dark it may as well be black. 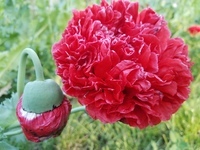 Stunning in combination with almost any other single color peony poppy. Victor swears this one has the scent of rose. It certainly has the color. 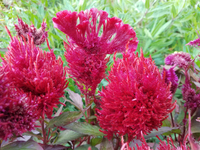 A bright red head isolated from the 'Perky Peony Mix'. I suspect this form/color has been named by someone else, but I cannot find it in my resources. So I've named it in honor of Lucille Ball, as suggested by Helen Dziuba. This perennial should be more widely known and grown. The intensely red petals make these a focal point in the garden, especially grown in masses. 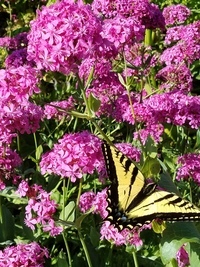 Begins blooming the second year, very attractive for butterflies and makes a long lasting cut flower. 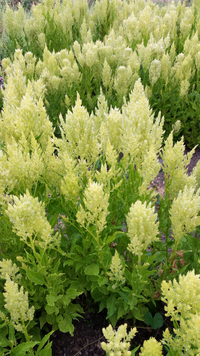 Blooms in late spring, and if cut back in early summer will rebloom through July. Leaves are medium green with fern-like pinnate dissections. The truest forms of this 1981 AAS winner seem to have disappeared from the marketplace, replaced by any number of colors and forms you can see onlne. Johnny's Selected Seeds has asked our help in this reintroduction of the classic 'Gloriosa Double' form, providing an excellent stock seed selection for an organic seed production, with blessings for us to offer it through our catalog. Larger quantities may be purchased through Johnny's. 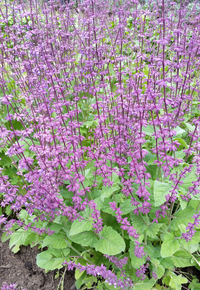 This is one of the few perennial sage species native to woodland habitats, so it is happy with a place in the shade. Flowers in the second year from seed, with spikes of lavender-purple flowers whorled about stems standing 2' tall. Not to be confused with Jerusalem purple sage (Phlomis purpurea or turerosa), completely different plants that show up in searches. Very attractive to pollinators, and gaining attention as a new cutting flower. 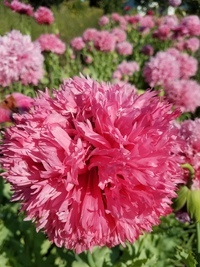 A good perennial for cutting, each mounded plant putting up 15-20 slender stems of hot pink lychnis-like flowers in dense clusters. Forms a low leafy clump the first year, followed by a brilliant show in year two. There is mass confusion online and in catalogs over whether this a biennial or perennial, but my favorite old argument solver, Hortus Third, splits that baby by saying, "...biennial, or short-lived perennial." Swallowtail butterflies massed all over them for weeks. Challenging to get a picture that didn't look like a butterfly portrait. Self sows, full sun to part shade, for borders, rock gardens, 6-12" spacing. Victor never stops saving out his favorite finds, and this is a selection out of Vintage Mix. Nice violet and lavender flowers, 67% doubles in this year's growout. These reach 15", perhaps a better garden flower than commercial cut. This is the untamed version of tobacco, normally grown for the extraction of pure nicotine. This would have been the first version of the plant to reach Europe, and is much smaller and more potent than the version domesticated by native Americans (N. Tabacum). Plants are 18-42" tall, leaves ovoid 4-8" long, flower corolla greenish-yellow the plant completely covered in a sticky pubescence. We grew this just to satisfy curiosity, and offer it just in case others have the same bent, or want some potent smoke. This is a selection from 'Ideal Florist Mix.' I was taken by the subtle pastel shade and the cupped shape made by ascending petals. For cutting, borders, or planters. 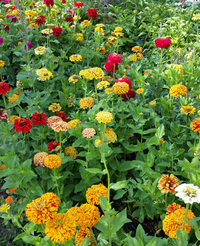 The commercial zinnia 'Peppermint Stick' isn't very true to its name, having as many red-striped golden yellows (and unstriped white and yellow variations) as it does namesake red-striped whites. Those red-gold doubles are a tempting item for isolation, but I suspect that there is considerable genetic instability in that bicolor form. This is the first generation grown from some beautiful, tall, doubled, red-striped golden "fireball" mothers. As expected the colors broke into a range of expressions including the fireball phenotype, but also solid golds, solid reds, red-wedge weirdos, and a few "peppermints" and whites. 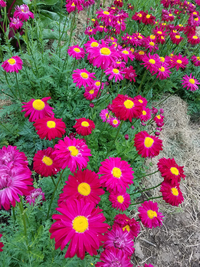 Mark commented that it was as beautiful as a zinnia patch could hope to be--tall, doubled, long stemmed, upright, with healthy foliage. 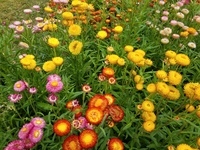 I took that as endorsement that a 'Fireball Mix' would be a good cutting zinnia for those bored by monochrome plantings. Farm Original Variety!